While listening to “The Queen of Air and Darkness,” the third episode of Brian Sibley’s adaptation of T.H. 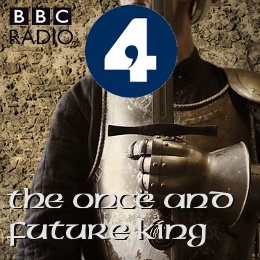 White’s The Once and Future King for BBC Radio 4 for a third time, something I had overlooked or had passed over me came to the fore and I had an unexpected insight. Am I an atheist because of T.H. White and The Once and Future King? There was, when I was I young, or will be, just such a man — an Austrian who invented a new way of life and convinced himself that he was the fellow to make it work. He tried to impose his reformation by the sword, and plunged the civilized world into misery and chaos. Oh, his name will mean nothing to you. But this thing which he overlooked was that he had a predecessor in the reformation business, who you will have heard of, called Jesus Christ, who knew as much, if not more, than this Austrian about saving people, but with one difference. Jesus didn’t turn the disciples into stormtroopers and burn down the temple of Jerusalem. On the contrary, he made it clear that the business of philosophers was to make ideas available and not to impose them on people. Now, with his forehead resting on the papers and his eyes closed, the King was trying not to realize. For if there were such a thing as original sin, if man was on the whole a villain, if the bible was right in saying that the heart of men was deceitful above all things and desperately wicked, then the purpose of his life had been a vain one. Chivalry and justice became a child’s illusions, if the stock on which he had tried to graft them was to be the Thrasher, was to be Home ferox instead of Home sapiens. This idea clearly had an influence on me when I was young. I never accepted the ideas of Original Sin or the grace of God; instead, I quite naturally adopted the Pelagian view, that humans could do good and be good on their own, without the need for church or religion or any of that saving stuff. I came at it from the realization that the world as a whole is not Christian; what kind of god would damn much of his creation simply because they weren’t Christian, and why aren’t their belief systems simply a different path to god? Yes, at a young age, I had quite naturally adopted universalist and Pelagian ideas. Those were the kinds of thoughts I entertained, and in time I would ask a question that detonated a powerful bomb on the fault lines of my understanding of the divine, and when the smoke cleared I discovered there was nothing divine there at all. Can I credit White, then, with putting me on the path to atheism? Did I recognize, as a child, the undercurrent of Pelagianism in The Once and Future King? Since listening to “The Queen of Air and Darkness,” I’ve wondered. In the third episode of The Once and Future King, the focus expands and, for the first time, we have scenes that occur outside the viewpoint of Arthur or Merlyn. We travel to the Outer Isles and there, in the Kingdom of Lothian and Orkney, we meet Queen Morgause, the wife of the powerful King Lot and the half-sister of Arthur. In an amusing and revealing scene, Morgause retells the story of Arthur’s parentage to her four sons (all of whom speak with Scottish accents and one of whom sounds, I swear, like he’s voiced by a girl) who interrupt and interject. It’s a story the children have heard before, it’s a story they like, and it’s a story they take obvious pride in. The retelling reveals something of Morgause’s personality; she tells the story with obvious bias and bitterness toward Uther Pendragon and the son her mother bore him, and she evinces impatience, even anger with her children when they interrupt her account of Arthur’s parentage. In the span of five minutes, we learn a great deal about Morgause — she has lived a difficult life, long ago events still have meaning for her in the present, she is determined not to be the victim that she believes her mother was, she is a magician of formidable and ancient powers (the titular “Queen of Air and Darkness”), and she will do what needs to be done to protect her family and further their interests. One of those interests is Lot’s rebellion against the young, upstart king in London, Arthur, and “The Queen of Air and Darkness” spends a great deal of time on what I call the “winning the throne” phase of Arthur’s life — Arthur, a young boy with no powerful backers and no obvious claim to the throne beyond a magical sword, wages a series of wars against far more established and far more powerful kings to demonstrate and confirm his right to rule. Here, in “The Queen of Air and Darkness,” Lot builds an alliance of several kingdoms to wage a war to unseat Arthur, while Arthur is reminded of a lesson from his childhood, a magical war between Merlyn and Madam Mim, that gives him the key to winning an unconventional war against overwhelming odds. Though Arthur is “winning the throne” here, the battles happen off-stage; Sibley keeps the focus on the lessons that Arthur learns from warfare and how he chooses to aply them. Arthur and Merlyn, with some help from Ector and Cay, discuss the necessity of and justification for violence and whether or not the human impulse for violence can be channelled into other and more productive directions. In some ways, “The Queen of Air and Darkness” has typical middle episode problems — we have pieces on the narrative board and we have to move them forward toward the conclusion, but they started moving before the episode started and have to keep moving after it ends, so their arcs in this episode aren’t wholly satisfying on their own — but it also had to introduce a number of new pieces (the Orkney clan) and get them set up on the board and into position. In other ways, though, this feels like a first episode; “The Queen of Air and Darkness” has to establish a competely new status quo for Arthur — the young king. Sibley limits Arthur’s interactions in the past to Merlyn, Ector, and Cay, which has the unintended effect of making Arthur’s world feel smaller than it really is. We get good conversations from that foursome — besides the conversation I quoted above, there’s a charming conversation in Arthur’s throne room where he works out the puzzle of Might, and the later conversation when Arthur conceives of the Round Table is wonderful — but Arthur seems more like a shut-in than a warrior-king. Despite those misgivings, this episode is as worthwhile as the previous two and The Once and Future King should, assuming I remember the story well enough, open up in the next episode, “The Ill-Made Knight.” We’ve already heard Arthur’s first meetings with Guinever (in “The Coming of Merlyn”) and Lancelot (in “The Sword in the Stone”), and conversations in this episode put Arthur on the path toward those first meetings. There’s another presense lurking off-stage, Merlyn’s love Nimue, and the final scene ends on an ominous note — Arthur has conceived a son with his half-sister, a son who will be raised in cruelty and named Mordred. Beyond that, the themes underlying the work — the question of whether might makes right and can might ever be used to good ends — have been planted and they are taking bloom. …this pedigree is a vital part of the tragedy of King Arthur. It is why Sir Thomas Malory called his very long book the Death of Arthur. Although nine tenths of the story seems to be about knights jousting and quests for the holy grail and things of that sort, the narrative is a whole, and it deals with the reasons why the young man came to grief at the end. It is the tragedy, the Aristotelian and comprehensive tragedy, of sin coming home to roost. That is why we have to take note of the parentage of Arthur’s son Mordred, and to remember, when the time comes, that the king had slept with his own sister. He did not know he was doing so, and perhaps it may have been due to her, but it seems, in tragedy, that innocence is not enough.